The Aeroflex-IFR-Marconi 3500A is available to buy refurbished used or rent, usually from our UK stock. Click here to download the Aeroflex-IFR-Marconi 3500A datasheet. Do you want to Buy and / or Rent? With the latest in portability, battery life and performance, the Aeroflex 3500A builds upon Aeroflex expertise in developing portable radio communications test sets with exclusive features and affordability that are destined to set a new standard in portable radio test sets. Designed to meet the needs of a multitude of radio tests, the 3500A provides fast, reliable measurements of the radios transmitter and receiver parameters. With the additional capability to perform quick testing of antennas and cables, the 3500A provides the most complete portable test solution available to quickly isolate problems and assess performance of the radio, cable and antenna systems. With the P25 option, the 3500A goes even further, providing you the tools to quickly check your P25 repeater, mobile, or hand-held radio. In addition, the tracking generator gives you the ability to re-tune your antenna duplexer located at your remote repeater sites. 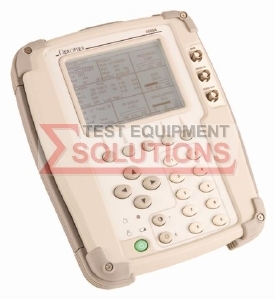 We offer the refurbished used Aeroflex 3500A Portable Radio Communications Test Set for sale and rental. The Aeroflex-IFR-Marconi 3500A is fully tested and refurbished in our in-house ISO9001 calibration laboratory. We supply manuals, accessories, full warranty and a free-of-charge Certificate of Conformity. We can also provide the Aeroflex-IFR-Marconi 3500A with a fresh calibration for a small additional charge. If you have under-utilised test equipment talk to us about trading-in or part-exchanging it towards the Aeroflex-IFR-Marconi 3500A or other refurbished test equipment.